One day when you wake up… You’re cracked up in the head! And when you start believin’ bull, you’ve got Mad Cowboy Disease! Mad Cowboy Disease! Mad Cowboy Disease! Please put ‘em all in padded cells, and throw away the keys! It can make you maladjusted, a person to avoid! You rave against the “terrorists”… Then you murder like they do! You even claim the peace-niks are terrorizing you! It’s mighty freakin’ dangerous, Mad Cowboy Disease! Positions in the government… and from the first they lied! But there ain’t no doubt about it, you can see their minds are gone! The crew that runs the White House… They’ve got this dread disease! You can see it in the madness of their greedy policies! There’s really only one cure for Mad Cowboy Disease! You’ll notice that they’re vicious… outing names like like rabid dogs! They’re very “anti-social”… They should be quarantined! Perhaps a ranch in Texas if its walled around you know! Last line in last chorus: And put “An End To Evil” Mad Cowboy Disease! 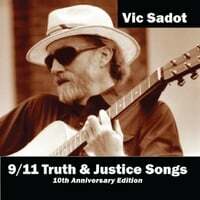 Song #6 on the 16 song 2011 9/11 Truth & Justice – 10th Anniversary Edition CD.